The Pentecost International Worship Centre in the Akim Oda Area of The Church of Pentecost (PIWC-Akim Oda) climaxed the 2018 National Youth Week Celebration with a cultural event dubbed: “Rep Your Culture”. It was such a great spectacle to behold as members were seen entering the church auditorium clad in the traditional adornment of their “preferred” ethnic group. Speaking on the theme: “Remain in the Anointing,” Elder Emmanuel Asante-Koree urged Christians to abide under the true anointing of God by examining the source and genuineness of the anointing they possess. He, therefore, stated that the anointing of the Holy Spirit received by Christians is meant to produce a “sweet-scented character” in them through the demonstration of the love of God to others. He also read from 2 Corinthians 2:15 to emphasize that Christians are the aroma of God among those who are perishing. 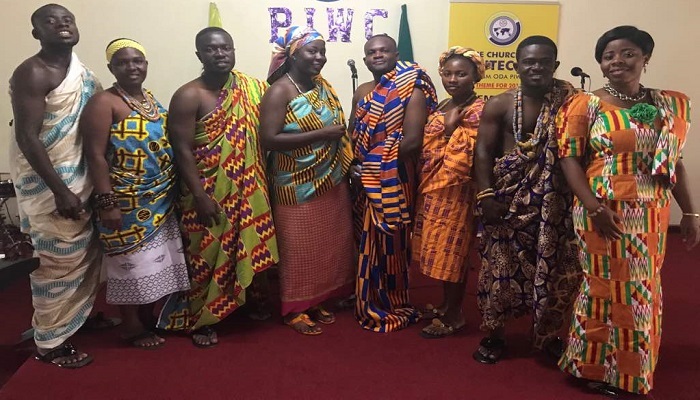 Elder Asante-Koree said that the fact that some youth members have put on the traditional adornment of ethnic groups which they do not necessarily belong to, in a way, demonstrates the “unconscious” love they have for the different cultures of the various ethnic groups. He, therefore, urged Christians to endeavour to love and live peacefully with all people irrespective of their ethnic background. Elder Asante-Koree also noted that Christians who truly remain in the anointing of the Holy Spirit consistently display the character of God in their daily lives. This, he said, is because the anointing of God is able to “heal” Christians of sin. Concluding his sermon, Elder Asante-Koree admonished the youth to remain in the anointing of God because of the rise in false teachings in recent times which is leading some Christians astray. According to him, being under the anointing does not mean living in freedom without control. He pointed out that it is always easy to stay under the control of the Holy Spirit when one constantly fellowships with the Holy Spirit and recognize God in all their doings. He, therefore, urged the youth to develop a personal relationship with the Holy Spirit in order to live a Holy Spirit-controlled life with ease. The Akim Oda Area Head, Apostle Peter Kofi Dzemekey, who was also present at the event, warned Christians to be mindful of prayer centres and some biblical doctrines emerging in the contemporary world. He also advised the youth to remain in the anointing in order to demonstrate God’s glory and make it to heaven.